Dolphinfish is a ray finned fish that inhabits warm waters centered around the equator. In Japan it is known to be caught as far as the Miyagi prefecture and as low as the Kouchi prefecture located in southern Japan. It is a popular game fish to catch by lure. 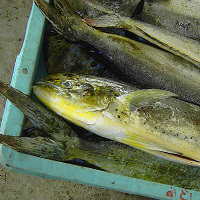 Ways to eat Dolphinfish include fried up in batter or as sashimi. The calories in Dolphinfish per 120g(1fillet) is 130 calories. Dolphinfish is calculated to be 108Cal per 100 grams making 80Cal equivalent to 74.07g with 25.56g of mostly protein、2.28g of fat、0g of carbohydrates in 120g while being rich in vitamins and minerals such as Vitamin B12 and Vitamin D.